Oats vegetable idli recipe - Oats vegetable idli is a South Indian style idli prepared using oats and black gram dal as basic ingredients. 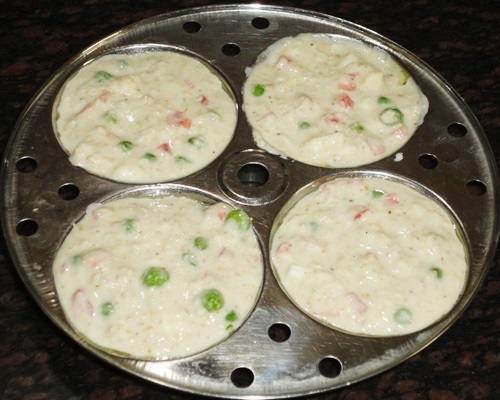 This is one of the easiest idlis that you can make at home. 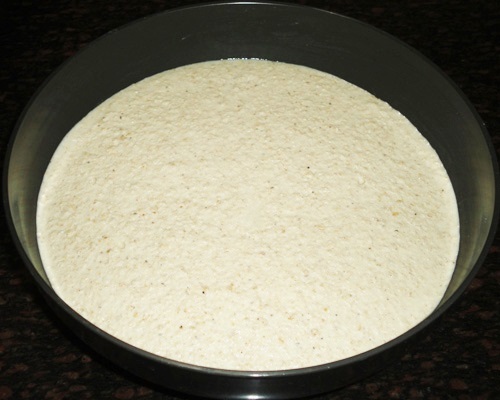 Like regular rice idli, the batter for oats idli needs to be fermented to get the soft textured idlis. But it can also be made without fermentation with slightly different texture. 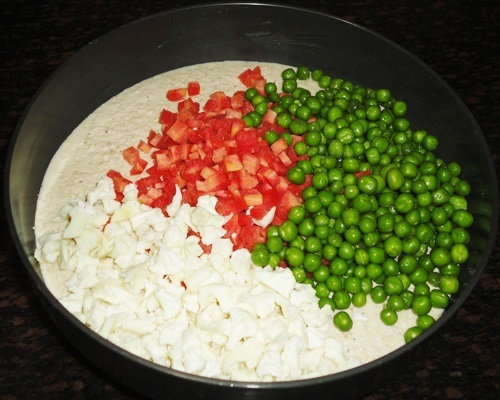 Vegetables such as carrots, cauliflower and green peas adds extra taste to the idlis. To get the enriched nutrition, adding vegetable is essential. Oats idli can be had as a breakfast, lunch or dinner dish. Mostly in South India, idlis are served for breakfast. 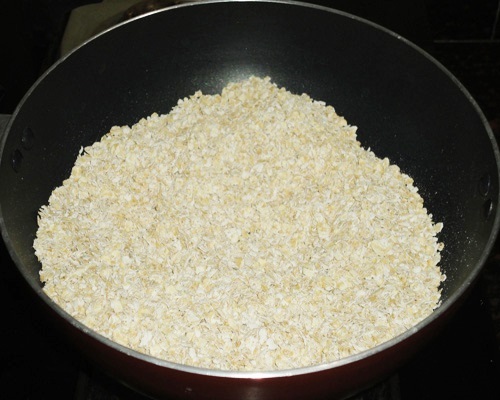 If you are looking for more oats recipes then check out simple oats idli and oats upma recipes. 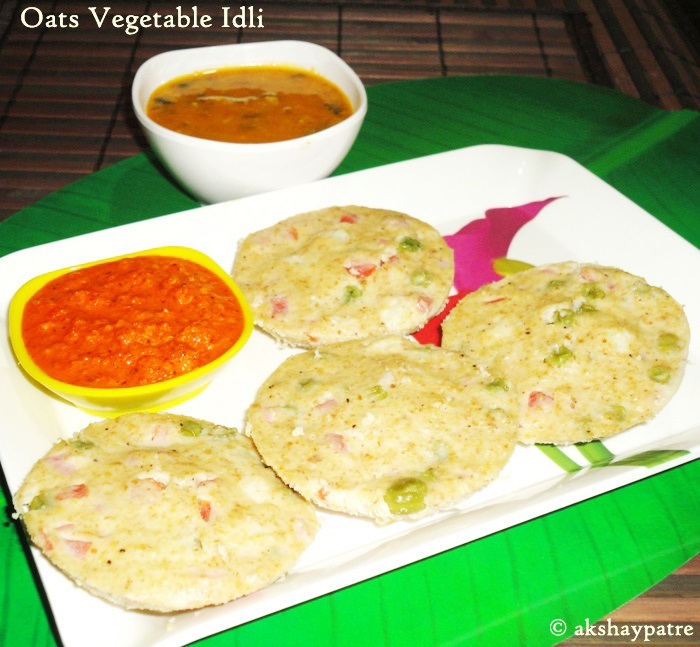 Here is how to make oats vegetable idli with step by step pictures. Wash and soak the split black grams for 6 -7 hours. Then grind it to a smooth paste using some water. Roast the oats in a pan on medium heat until crisp. Cool and blend it to a coarse powder. Mix the urad dal paste and roasted oats powder. Mix well and keep it aside for 8 - 10 hours. 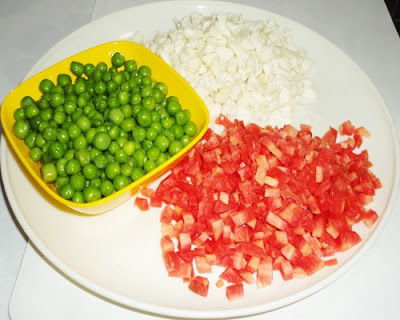 While making idlis, wash the carrot, green peas and cauliflower florets. Mix well till the batter, vegetables, salt and yogurt combine well. 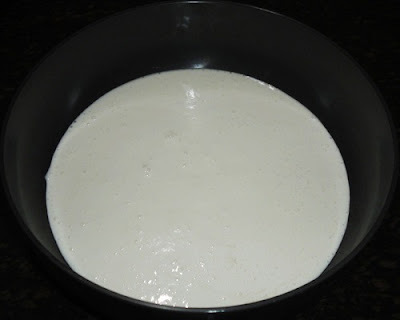 Grease the idli plates and pour the batter in the mould. Pour sufficient water in the bottom of idli cooker. Place the idli plates in the idli cooker. Cook on medium flame for about 15 - 20 minutes to make the oats vegetable idli. When the idli is done, rest it for 5 minutes and then remove the idlis from the moulds. 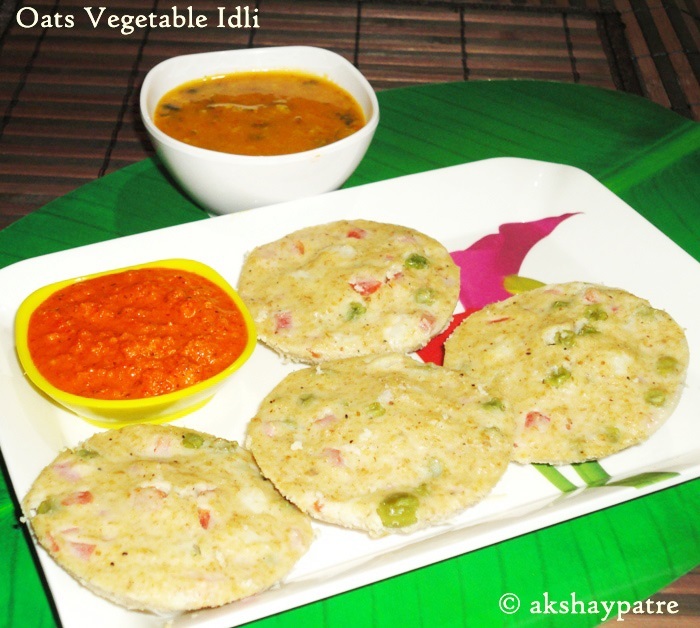 Serve the oats vegetable idli hot with chutney and sambar. 1. Heat a pan and roast the oats on medium flame until crisp and aromatic. 2. Cool the oats and put them in a mixer jar. Blend it to a coarse powder and transfer to a vessel. Put the urad dal in the same mixer jar and grind it to a smooth paste to make idli batter. 3. Pour the urad dal paste into a large vessel. 4. 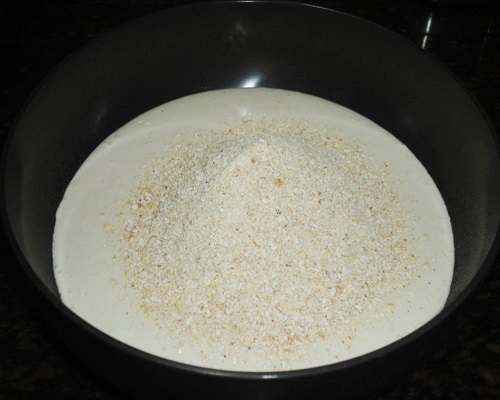 Add above prepared oats coarse powder in the batter. 5. Mix till the urad dal paste and oats powder combine well. Keep the vessel in a warm place for about 8 - 10 hours. 6. Chop the carrots and cauliflower florets into small pieces. 7. Add the yogurt, salt and chopped vegetables to the batter. 8. Mix till the vegetables combine well with the batter. 9. 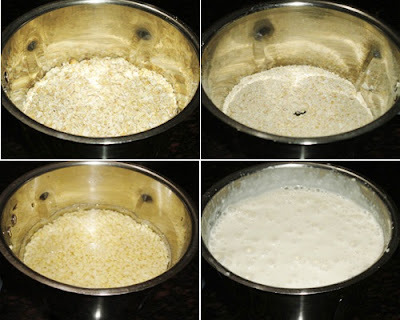 While making idli, pour the batter in the greased idli moulds. 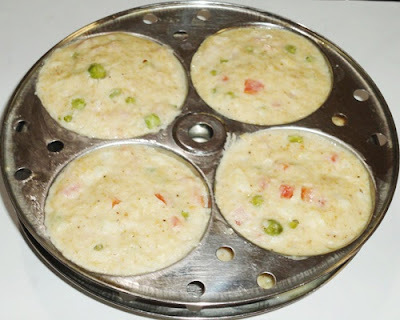 Place the idli mould plates into the idli cooker with sufficient water in the bottom. 10. Cook on medium flame for 15 -20 minutes to make the oats idli. Switch off the flame and rest it for 5 minutes. 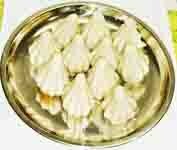 Remove the idlis from the mould. 11. Serve the oats vegetable idli hot with chutney and sambar.